Every year, for the past 21 years, I participate in a cross-country ski race called the "Loppet." A "Loppet” is a large gathering of skiers who ski on a specifically groomed trail of various distances, using either classic (diagonal stride) or free (skating) technique. Enormous amounts of food and drink are consumed during the event. After everyone finishes or is carted off the course, there is a party and celebratory banquet with awards, prizes, and usually beer. I opt for champagne consumed at home before heading to the banquet. The Loppet means different things to different racers. For some skiers, it is an intense competition. 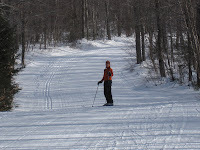 For others it is a relaxing way to spend a day outside, taking in the pristine beauty of the Adirondacks and enjoying the meticulously groomed trails, home-grown entertainment and camaraderie along the way. Sometimes I act like a competitor and ski as fast as I can until I toss my cookies climbing the huge hills on the Porter Mountain racing loops. Those were the years when I managed to get hardware, or place first, second or third in my age group. Most of the time though, I lolly-gag along enjoying the day. I first decided to give this event a try 21 years ago when I worked for the sponsoring insurance company and the race was called The Lawrence Loppet. We had a company team in those days, and partied pretty hearty the night before. It was always fun to see who within the firm would actually finish and who got a free snowmobile ride back to the stadium. The Lawrence Group out-of-towners usually underestimated how hard and long the course was and overestimated their fitness levels. The race in now called The Lake Placid Loppet, but follows the same challenging trails. This year's event is scheduled to be held this Saturday, as usual, at Mount Van Hoevenberg, my second home. It will be a mosey for me this year, but I am still looking forward to having a great time skiing as fast as I possibly can down those steep hills like the one pictured on today's featured photo.